Views from the loch. : All comes to.....! Photo 01- A man content with the world! One of our members Barry Leslie recently appeared on these pages with a fine wild Brown Trout from the loch. I knew that he also fished for Pike but never heard him mention catching any. Well there was a reason for that because in his outings to try and tempt the supreme predator lure fishing he had been unsuccessful! Many would have given up but not Barry! Photo 02 - The icing on the cake for Barry! He persevered and eventually he found himself in the right place at the right time. 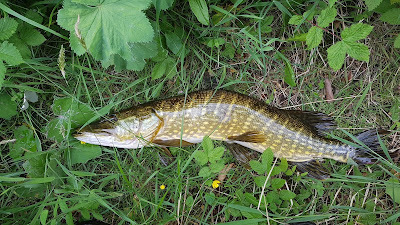 He was up at the secret swim darting a few lures out when the line went tight and a Pike finally came to the net. Well they say that good things eventually happen and after an arduous apprenticeship of 2 years and 4 months Barry struck gold! 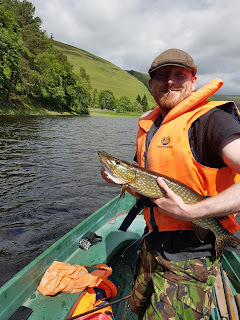 Indeed a further fish came to the net topping off Barry’s induction to Pike fishing! None of the fish were huge but like me last week a most welcome fish after a drought those fish were worth their weight in gold! Indeed it’s true – all comes to he who waits as Barry and I can testify! Photo 03 - How many Spotted Flycatchers can you make out! Our boat house spotted flycatchers are doing very well. You will see from the photo above they have grown significantly the beneficiaries of intense feeding by mum and dad! We are not sure as to the number of chicks estimates are between 3 and 5. 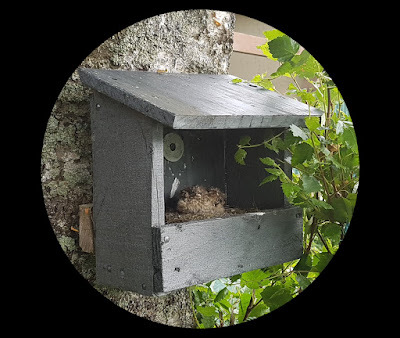 We did not want to cause distress to the family so only long range photos were taken.You can now see the pattern developing on their feathers and the word is that this next 7 days will see them fledge! We may not knowingly see these birds again but we are delighted they chose to nest in our domain and we wish them well for the future! 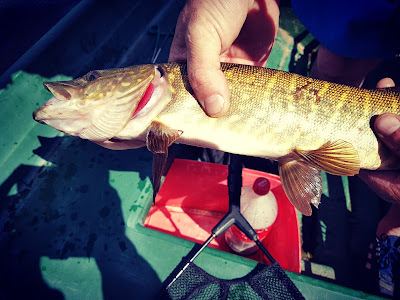 Photo 04 - A deformed Pike I caught yesterday feeding well! We have now heard back from the sailing club and they have consented to a meeting with our club. Due to my work commitments the date they suggested is unsuitable but I have invited the Commodore and Vice Commodore to a meeting in the club boathouse the date of that Saturday and the time of the meeting to be decided by them. Arguably we are now entering a pivotal moment in the country’s history; a time which could see us sink or swim! What makes this a hundred times worse is the fact that we have a government capable only of staggering incompetence! In every aspect they screw up seeming to have no clue whatsoever as to where we are headed impervious to the many they will destroy on the journey to nowhere! A rudderless ship does not cover it! Theresa Mayhem lives up to her name on a daily basis a wooden robotic woman who is seemingly repulsed by working class and poor people in our society. A woman who wants the ordinary citizen to have no privacy whatsoever our each and every move closely monitored! A woman of no judgement making the wrong call on every occasion, every time she speaks in public the Tory support falls which is a very good thing indeed! And as if that was not enough her cabinet of horrors contains a mixture of outright buffoons and would be Victorian mill owners! Jeremy Hunt a man loathed by health workers seems to be only capable of implementing pointless health service reforms which turn out to be unsettling, pointless and costing the taxpayers millions of pounds and all to end up with an operating system which is worse than the initial situation prior to meddling! On top of this his continual denials reveal that his primary aim is to privatise our beloved National Health Service farming lucrative contracts out to his city pals leaving the NHS with the mundane basic service that he desperately seeks! His vision is for a continuation of the current system in which if you have the ability to pay you can have prompt top class intervention and care and if you are working class navvy you have to join an ever increasing waiting list. Couple that with early discharge and fragmented follow up and you are an ideal candidate for emergency readmission! Often portrayed as a rising star in the government is home secretary Amber Dudd and she is well named! A hardliner who models herself on “Butcher Thatcher” is absolutely intent on removing any civil liberties that we still have! David Davies who apart from issuing threats to the EU has been little heard of. Portraying himself as the no nonsense hard man of the Tory party he blew his image on the first day of EU negotiations caving in to the demands of the EU. The phasing of negotiations which he said would turn out to be "the row of the summer"ended with Davies capitulating on one of his key demands and as usual with Tory policy it turned out to be a damp squib!The list is endless super buffoon Boris Johnston, ace twit and backstabber Michael Gove to name but a few, we have quite simply in our government a bunch of fools, loudmouths and rank incompetents! What a pity then we are lumbered with them thanks to the thousands of Scots who unbelievably voted for a Tory! For this government there is no turning back and for that reason alone we need to get them out! Labour are 3-5 points ahead in the polls, astonishingly Jeremy Corbyn is two points ahead of Theresa Mayhem in personal rating something that no one predicted! The latest poll on Brexit shows that 72% of people now want to remain in the EU. Clearly Brexit is looking to be a complete and utter disaster! The future for those who come later looks to be extremely perilous at this time and the court jesters we have in office look to be increasingly impotent! We owe it to those future generations to create a future where there is hope and prospects for a fair and equitable society the first step to this end is to get these blundering Tories out!